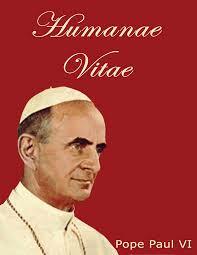 This July marks the 50th anniversary of an important papal document for healthcare, namely Humanae Vitae. Humanae Vitae means “Human Life” in Latin, and the core of this letter addresses humanity’s search for freedom and control. However, this freedom is not the contemporary thought of doing anything you feel like doing, but freedom as defined as the ability to freely choose virtue. Or another way of thinking about it is to be a master of your passions and desires. For example; I personally love ice cream. Now I do not know about you, but I know that it is not good for me to eat an entire tub of ice cream, even though I want to and I am certainly capable… It is not the best decision for me to do it… So at times, I have to deny myself of eating ice cream… This denial of self is a small example of what it is like to have self-mastery and thus be truly free. Every time you tell your bodily desires “no,” takes a discipline. And just like other disciplines, we have to start out small and work up to the bigger challenges. As you can see, I am not a runner, but I have been told, that running a marathon takes a great deal of training. I hate to break this news to you but if you cannot run a mile, you cannot run a marathon… You have to start small but dream big. Self-mastery is not a sprint, it is a marathon. So I ask you, where in your life do you need God’s graces to attain freedom from your bodily desires?